An automobile is a major investment regardless of whether or not it is new or a used model. It makes sense for an owner to try to get as much return on that investment as practicable and that requires some common sense maintenance. It doesn’t have to be a major expense, either. Having the right tire pressure in the car will not only keep performance up, but also improves the miles per gallon (MPG) the vehicle will receive. Maintaining the proper tire pressure has a little bit of the Goldilocks fairy tale to it: the pressure should not be too high and not too low, but just right. There are unique problems with over or under inflated tires. When a tire does not have its proper amount of pressure it actually loses its shape. The tires should be nice and round; under inflated makes them flatter. This has a dramatic effect on performance. The tire does not have proper contact with the road and this will result in trouble while doing cornering or any type of steering that will require precision. A problem with less than desirable pressure is the motion of the tire itself. The entire supposed to roll and an under inflated tire will bend more often. That creates a degree of rolling resistance which in turn decreases fuel economy by as much as 5%. People will try to compensate for that by over inflating tires. These car owners had the best intentions but different problems are actually being created. Over inflated tires don’t yield to the road and this can reduce contact. One of the consequences of winter moisture is potholes. An over inflated tire is easily damaged when running over potholes and the same is true if they are riding over tree limbs or cans in the road. The ride itself can be a little bit harsher because over inflated tires will tend to bounce. That can cause problems with traction. It goes without saying that improper air pressure is going to wreak havoc on the tire itself. A great deal of stress can be placed on treads due to increased friction with the road, or the bouncing that results from over inflated tires. Car owners may think that the pressure number that is listed on the tire is the correct amount for the given tire. That is not true at all. What is actually noted on the tire is the maximum amount of pressure that can be in that tire. It is not the recommended amount. The owner’s manual of the car can give exactly what the tire pressure is for the given car (keep in mind the pressure is different for the tire depending on where it is located). There is also a sticker either in the glove compartment or the door pillar on the driver side. This will indicate the recommended amount of pressure for the tires. 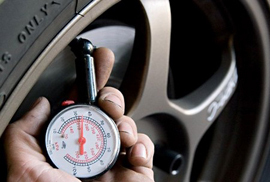 A car owner can periodically using air gauge to assess the pressure in the tire. This just takes a moment and it alerts the driver to whether or not there is a pressure problem in the tires. There are several benefits for maintaining proper tire pressure. Safety is enhanced because the tire with proper pressure has a better command and traction of the road. It is estimated that fuel economy can be increased by as much as 3% of the tires are at the proper pressure. Performance is enhanced because properly inflated tires do not stress the shock absorbers. There are other parts of the car whose performance is enhanced such as the brakes. A final benefit rescues tires themselves. Tires are properly inflated have much longer life than those that are over or under inflated. The treads hold up longer, and there is less difficulty driving on uneven roads. Tires as a purchase are not inexpensive, and a set of four tires can easily cost several hundred dollars. Maintaining the air pressure extends the life on all four. It is relatively simple to maintain proper air pressure. Inspecting the pressure ought to be a weekly practice for any sensible car owner. 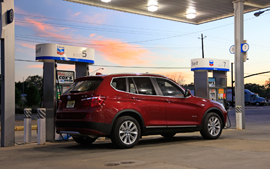 The simple maintenance helps fuel economy and also the overall performance of the car itself. An automobile is a major investment that ought to be maintained. Keeping a watchful eye out on the tire pressure is one of the ways to have better fuel economy and extend the performing life of the vehicle as well.